The magic of this recording resides in the touching story, based on historical facts, of the life and music of one of the greatest composers of the world. In “Beethoven lives upstairs”, the arrival of an eccentric lodger disrupts the life of a young boy of the family, a certain Christoph. Ludwig van Beethoven has come to stay! The child is not pleased to see the unloading of the new tenant, but little by little comes to appreciate his genius, the beauty of his music and the tragedy of his deafness. 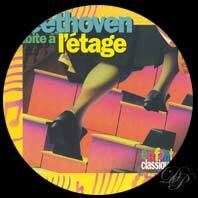 The recording contains more than 35 extracts of Beethoven's most appreciated works, notably the symphonies, the Fifth and the Ninth, the sonatas “Moonlight” and “Pathetique”, the “Spring” sonata for violin, the Serenade for flute and a number of pieces from the repertoire of young pianists such as the Sonatine in G major, the Minuet in G major and the famous “Für Elise”. A great success which merits to be heard by the little ones as much as the big. A magnificent work! There is also a DVD with an educational section on cd-rom. 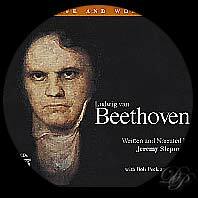 Two double CDs entitled "Beethoven - His Life and Music". 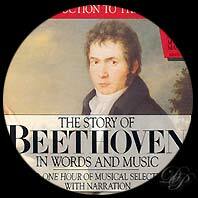 Ludwig van Beethoven's story is told, with numerous musical interludes. All in all it is a pleasant and lively work. A good way to discover Beethoven. Also by Jeremy Siepmann: 'An Introduction to Beethoven: The Pastoral Symphony'. Arthur Hannes tells a short story of Beethoven's life, not always in an accurate manner. The music is performed by the Bamberg Symphony Orchestra conducted by Jonal Perlea.